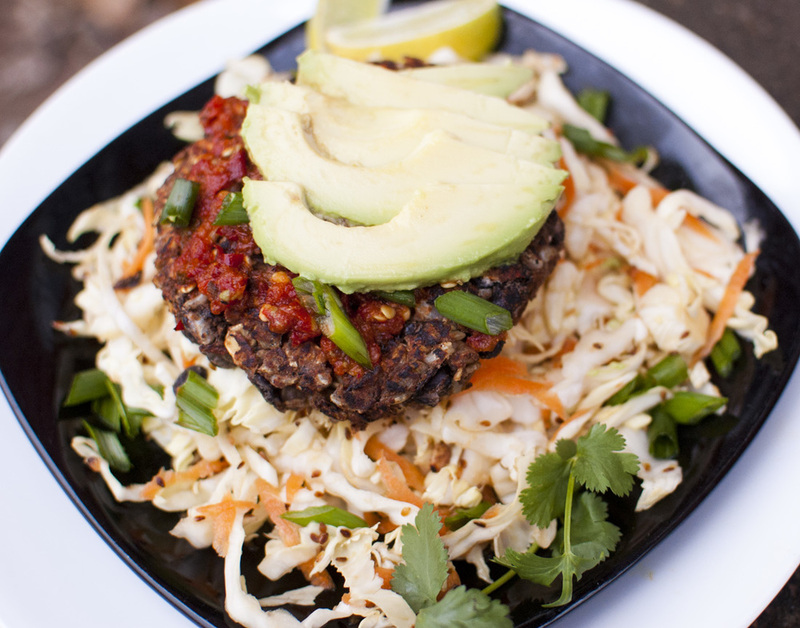 I love my Easy Black Bean Burger recipe - it's so versatile! Like when I was craving something extra spicy the other day all I had to do was throw in some hot sauce and BAM! A whole new tasty experience. It helps that the hot sauce was Sriracha, the most crazy addictive hot sauce ever. If you've never had it, it's a little sweet, a lot spicy, a little salty and little bit garlicky. It's awesome. Really. Made a lame dinner? SRIRACHA TO THE RESCUE!!!!!!! Or Made an amazing dinner but feel like spicing it up? Sriracha it is! Oh silly vegans, we just love our sriracha. Then, since I wanted to eat lots of food, I decided to throw the burger on top of some simple oil-free slaw. It did not disappoint! The key was the toasted sesame seeds. Yeah, they do contribute some fat to the dish, but not much. A tablespoon has 4.5 grams of fat but it also has iron, calcium and even protein! And you could even get away with using only half the amount of sesame seeds and it would still have a ton (I MEAN TON) of flavor! I garnished it with avocado, cilantro and green onions - none of them are necessary but they are fun! I actually gave most of the avocado to my kiddo - she LOVES avocados! Form mixture into patties (it should make 4) and place on the parchment paper. Bake for 12 minutes and then flip gently with a spatula. Bake for another 10 minutes and let cool a bit. Then eat! Store leftover ones in the refrigerator for a few days or you can freeze them. To toast the sesame seeds - place the seeds in a skillet over medium high heat. Make sure to stay with the pan because this should take less than 2 minutes. Shake the pan back and forth over the heat as the seeds start to brown. Some may pop up and out of the pan if you're not careful! Once they are nice and brown take the pan off the heat and pour the seeds into a small jar or glass container to make the slaw dressing in. If you want to get fancy with it you can garnish the whole thing with some sliced green onions and/or cilantro. If you want it to be spicy as well you can add a pinch or two of chile flakes! Yum!